Currently we have become engrossed in Business Training again. I say again as it was something we did just after our son was born, four years ago, and the changes we made to our business were subtle but had a big effect on our business; the only problem with it was that it cost a lot of money and the two different coaches we had both went out of business – not good news at all when they are supposed to be giving advice on how to improve your business! This time we have joined the Oxford Business Wealth Club to take our business to another level so that we can join like minded business owners and really get things moving in the right direction. 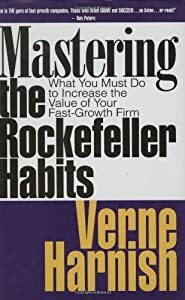 So this week I have had to read the book (I say ‘had’ as Catherine the missus read it first and then I’ve had to read it to get on the same hymn sheet before a whole day of training we are going to be doing at the end of this week) – ‘Mastering the Rockefeller Habits’ by Verne Harnish, a relatively light read, and because of this we are now firming up our strategy approach to our business for the immediate future and into the not so distant future. We are going to be sorting out strategy and our sales funnel in the whole day work out with our coach Paul Avins, some one I have known for a while now. Also this week we have started making changes to our office, to get rid of the junk for example, I have sold two large 1000 litre storage tanks (IBC) which have been in my yard unused for 18 months, and I have arranged for the coffee machine we have had for five years on lease to be returned back to the drinks company this week and it is going to be replaced by Nespresso coffee machine, hurrah. And in the gap left by the coffee machine on the office kitchen work top I plan to get at least one new oven which is suitable for training – probably a NEFF if I can find one which fits the bill. So yesterday (Tuesday) we had to be in Oxford for a 0700 start – we drove up the night before and stayed locally. We took our son with us and he had breakfast with my wife whilst I was in the main room for the The Business Wealth Club (BWC). My wife then took him down to a Summer Camp run by one of the other BWC members where he spent the rest of the day – the BWC training finished at 1200. The BWC works like a breakfast club but with the addition of business training as an add on. So you do the stand up and talk about your business for 45 secs and also you get topics to discuss. Also this week because of the sad news of the death of Stephen Covey we had to come up with a list of the 7 Habits as a table, which was useful. This week the main theme was: how to increase and improve the leads for your business. So from this I have re leant that for us the main thing we need to look at is our conversion rate on our advertising both on the web and in hard copy and really get to the core of the figures. For example I run Google Adwords for our main business and also for each of the franchisee areas. If you don’t know anything about my background, other than my oven and AGA cleaning expertise, my main skills are internet marketing, including SEO and Google Adwords, and more recently Social Media marketing which have grown through the years. I used to be an IT consultant and when I started cleaning I carried on with some aspects of the IT which ended up taking me in the direction of Google Adwords and SEO. So I have large (ish) campaigns running for the business and over the years I have worked out the optimum way to make them perform and produce the results for our business and now the franchisees’ businesses, but they still need managing. The key thing from the day for me is I really need to get those figures tuned up and really look at how our advertising is converting. I think I have become complacent and really I need to put some steps in place to review everything and get the ad performing even better. Some interesting things were said about proofing Ad copy on Google Adwords before running them in hard copy, say in a magazine; I’ve always thought that high conversion rates have been enough but I think if I do some split testing on my ads I can make them and the conversion rates even better. So hopefully our oven cleaning business adwords will be taken to the next level! Also one of the topics we talked about on our table was Customer Relationship Managers (CRM) We need some sort of CRM to deal with Franchise enquires, and funny enough I think I’ve found the ideal one today, and I am trialing it for a week I let you know what I think about it when I think it starts doing when we need it to do.